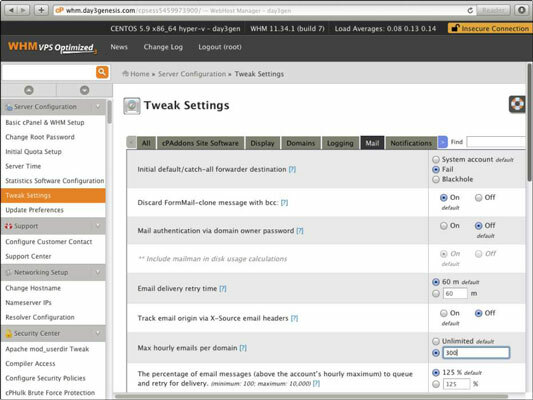 With access to the backend of your server, you also gain access to some Web Host Manager mail functions that were previously unavailable to you. Scroll down the left-hand menu of WHM to find the section called Mail that’s near the bottom. In this section, there are options that may be useful to you if you have problems with your mail or if you want to monitor the mail. Sometimes, if your mail is not working correctly it is simply because the folder permissions where your mail is stored have become messed up. It’s something that just happens. It doesn’t hurt to click Repair Mailbox Permissions and then Proceed every now and then and allow the server to check that everything is in order. This may even solve certain problems you didn’t know you had. Occasionally users complain they cannot access the e-mail or cannot access certain folders. Running the repair command often solves that problem for them. It should take five minutes or less to run, depending on how many domains you have on your server and how many e-mail addresses are set up under each domain. In theory, when you click Mail Queue Manager there shouldn’t be any mail shown. However, the way the mail system works, the mail queue manager handles the sending and receiving of all mail. It is like a mailroom at your local post office: It sorts the mail and directs it to the correct location. There are a couple of reasons why mail gets caught up in the mail queue. Scrolling up to the Server Configuration section at the top of the left-hand menu in WHM and clicking Tweak Settings. Clicking the Mail tab in the screen that opens. Scrolling down to the Max Hourly Emails per Domain item and changing the number in the box. Scrolling to the bottom and clicking Save. Items also get trapped in the mail queue manager if they are being sent to servers that have blacklisted you. This happens if your server or website has been hacked and someone is using it to send spam e-mail. If people are reporting that they are not getting e-mails from you, it can be a good idea just to check your mail queue manager. There are two main options within the mail queue manager. One is to deliver the mail now; the other is to delete it permanently. You should check your mail queue manager periodically, delete mail that is stuck if it is not needed, and force it to deliver any that you need delivered. If the mail queue manager is still unable to deliver your mail, it adds the mail back into the queue, and you can look at the error message to see the reason why it didn’t go. If you are having mail issues, try restarting the three mail services (IMAP, Mail Server, and POP3 Server) and sending/receiving mail again.